Fernandez & Leluu: PASTRY FIRST then THE WELLINGTON! PASTRY FIRST then THE WELLINGTON! OK lets start with the important theory, the flakyness of the flaky pastry comes from the layers of the flour and mixed fat. To make sure those layers stay intact try and keep the process cold to maintain the integrity of the layers of fat. If something isn’t in use keep it in the fridge. First mix the two fats together. Easiest way is to take the fat and cut it into smaller chunks and mix it with knife (or fork). Divide this into quarters and put ¾ into the fridge. Cut the remaining quarter into the plain flour and work it in with your fingers. Or using a plastic dough blade use a food processor – 4 seconds and check it, if it even grained that’s perfect. Remember the longer you have anything in a food processor the hotter it get so keep it to an absolute minimum! The next step is to add the ice cold water and keep mixing the dough until there’s no loose flour in the bowl, it’s ok if it’s very slightly sticky but don’t get it gloopy – that’s a technical term for when you’ve added too much water! – or you’ll have a lot of trouble with the rest of the steps and you’re baked things will come out looking like the joker after he’s fallen in the chemical works, messy! Once you have your dough, put it in the fridge for 20mins. Then roll it out on a floured surface until it’s ¼ to ½ an inch thick, but more importantly it should be 3 times as long as it is wide. 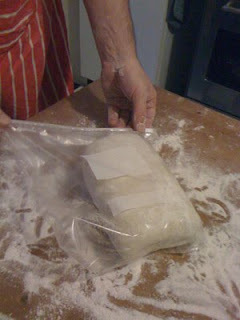 Don’t forget we want to keep it as cold as possible so handle the dough as little as possible. Next take one of the remaining 3 quarters of the fat and paste it in small blobs over 2/3 of the dough. Fold the uncovered third of the dough over half the fat and fold what remains in towards you. This is forming the first 2 layers. Turn and roll out to the same size as before. Repeat the above steps another 2 times with the remaining 2 quarters of fat. Once all the fat is worked in repeat the folding process 4 more times, seal in a dry plastic bag and put in the fridge for at least 20mins before using. The great thing about pastry is you can make a big batch I usually use 1kg of flour and appropriate amount of fat (4:3 flour:fat) – which is the absolute capacity of my blender!! – and freeze it as 4 blocks in their own separate bags. It will keep in the freezer for 2 months : ) Great thing to have in the freezer over the winter months to make fantastic energy food: jam puffs, eccles cakes, bacon swirls, pies, cream horns, and the greatest pie of all the Wellington!